← Amazon Recommendations, quite peculiar. One thing about being a college student: your life is measured in terms, broken up by occasional seasonal vacations. We just finished winter break here, and now everyone is grudgingly heading back to school. Winter break is just about three weeks long, so it’s a nice break from classes. My wife and I had intended to take a week off and go visit family, but I wound up scheduled to work and she had to travel alone. That meant that, well, I was left alone for eight days with nobody to tell me that I was crazy to start new projects. A while back, I inherited a eMachines EL1209. This is not exactly a high spec machine; it’s a single core 2.4GHz Athlon with an Nvidia 8200 on-board chipset. I put it in the closet for a time when I had a project that needed it, and then promptly forgot about it. 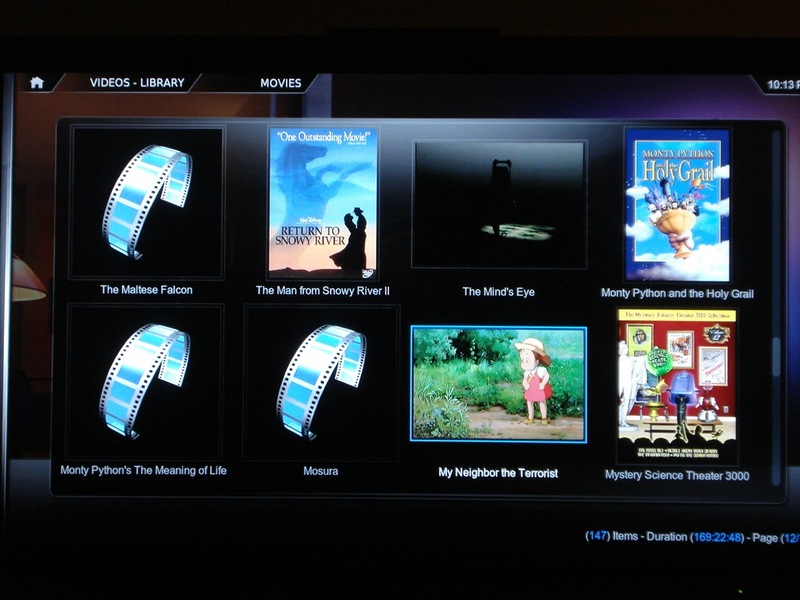 That is, until I got the bright idea to spend winter break setting up an XBMC box. I didn’t remember it at first, though, I was browsing Newegg trying to decide if I could whip up an XBMC box on the cheap and had come to the conclusion that it was going to cost about three hundred bucks that I really couldn’t justify before something jogged my memory and I decided to see if I could make use of the hardware that I actually already had. Turns out that the new build of XBMC supports hardware-accelerated h.264 video playback, and that the Nvidia chipset on the board was actually beefy enough to decode and play back 1080p video with no problems, which was pretty impressive. On the other hand, it couldn’t upscale 720p video to 1080p without getting rather choppy, so I set the box to boot into 720p resolution and all was well. …yeah. Puts a whole new light on Tonari no Totoro, I’m telling you. I wound up creating a lot of .nfo files from scratch, one for every movie in my library, and then I spent some time renaming TV episodes so they matched up with thetvdb, and then I had a library that looked, well, it looked pretty good. It was only a first step, though. After I had the video library knocked into shape, I installed a MAME launcher, which wasn’t too bad to set up, I installed Hulu Desktop and got XBMC and Hulu Desktop co-existing on the same box, which wasn’t at all trivial and took installing Eventghost to get working, and I decided that I was going to figure out a way to get our photos to display through XBMC. I keep photos in iPhoto. It’s a nice piece of kit and I have few complaints about it, but one of its charming little foibles is the way it stores your photos. Rather than being kept in a folder structure under, say, ~/Pictures, they’re hidden in a photo library (honestly, not a bad thing inasmuch as it keeps them safe from manual user twiddling). Unfortunately, it makes it tricky for third party software – like XBMC – to get at them. Fortunately, I was saved by Google, in two ways: First, the rather common way in that I used it to search for a solution, and second in that the solution I finally found was authored by a Google engineer during his 20% time. Phoshare let me export the entirety of my iPhoto library into a nice directory structure split up by events, and moreover it lets me synchronize the iPhoto library to the exported copy at any time and only export photos that are new or that have been changed. Anyway, the end result of all of this was that I had a home media PC set up with all manner of movies and TV shows and emulated arcade games and family photos and life was good and then it was just about time to go back to school so I couldn’t actually wear a groove in the couch enjoying the fruits of my labor. Oh well. Three months and I’m done!